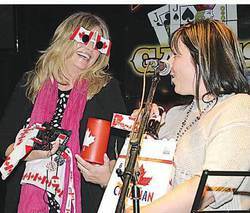 Stefanie Schulz, (on left wearing the Canada flag glasses) the outgoing Leduc Regional Chamber of Commerce Executive Director, is presented with much Canadian swag at her going away party. Chamber President Cindy Guy (on right) presented the gifts on behalf of the Board and Staff to ensure Stefanie would always remember where home was while she and her husband spend the next three years in Australia. …to you, and you, and you, and you, and you! As the famous line goes from the song So Long, Farewell from the Sound of Music. And it really was a long series of farewells and goodbyes for the Leduc Regional Chamber of Commerce's popular Executive Director, Stefanie Schulz. Stefanie and her husband Torsten recently broke the news that Torsten's work was transferring him to Australia for three years, so with very short notice Stefanie was having to leave her position as E.D. at the Chamber. This was extremely sad news to everyone who had gotten to know Stefanie over the course of three years as E.D. After taking the position during a very transitional time for the organization, Stefanie's fun loving personality definitely helped put her own stamp on the Leduc Chamber. According to both Stefanie and her staff, which consists of Jennifer, who had also previously worked with Stefanie at her former job at the Leduc Economic Development Association, Tracy, Jessica, and Pam, over the course of time they became like family. So, it was no wonder, when you have a family member leaving, that you would throw a big party for them, and this is just what the Chamber staff and board did on June 21st at Blackjack's Roadhouse. All the movers and shakers in the region showed up that evening to wish Stefanie much good luck in her new (but hopefully temporary), home. Having worked extensively to promote this region to the world, Stefanie had the opportunity to meet and work with many people in both the political arena as well as businesses big and small, and a very large number made an appearance this evening to show their respect for her. Over the course of the evening Ryan Maier, a radio host on The Bear played guitar and sang on stage, presentations were made to Stafanie on behalf of her staff and board as well as the City and County of Leduc. MLA George Rogers voiced the overall feeling of the evening, and the reticence with which everyone was letting her go, when he stated with a smile, "Stefanie, we're here tonight because we want to be but we'd really rather not be." Chamber President Cindy Guy had trouble maintaining her composure as she both officially wished Stefanie well on behalf of the Chamber Board, and then had the crowd bursting with laughter as she presented Stefanie with her Canadian ‘care package,’ which, amongst many other things, consisted of Canada flag sunglasses, a Canada key chain, a frosty mug, pencils, pins, lanyard, and passport holder all adorned with maple leaves, and of course the ultimate symbol of Canada, several bottles of, (what else?) Canadian beer! Clarence Samuelson, a talented musician who works with the Devon International Music Festival and had travelled to Grimma, Germany with Stefanie to promote the cross cultural ties between Grimma and Leduc, and his wife Melanie, took to the stage to serenade Stefanie with the hand picked songs ‘Someone To Watch Over Me’ and ‘What A Wonderful World’ on trumpet and piano. Stefanie, who was visibly touched by the entire evening, then came onstage to address the crowd. She said with a sad smile, “It's time to say goodbye and I knew you wouldn't make it easy on me! There hasn't been a day I haven't loved walking through those Chamber doors and into work. The circle comes to a close as this brings to mind moving here 13 years ago. Australia will be a big adventure but this is leaving home once again and part of my heart will always be here." The consensus is that Stefanie will also be taking parts of our heart with her as well, and I think this is best exemplified by the some of the people who had the great opportunity to work closely with her over the last few years. So Stefanie, we here at the a Pipestone Flyer, as well as everyone who had the privilege of knowing you, wish you well in the future, and we leave you with these well deserved words from a few of the people who will miss you the most. Dean Ohnysty, Director of Parks and Recreation for Leduc County – Stefanie has been a great partner over the years as she and I had similar visions and goals for the region. She is trustworthy and someone who I had no concerns in approaching for support. I could always count on her being there for the recreation department. Don Shay, Founder of Accrescent Consulting – It's a huge blow to the Chamber to lose Stefanie. She has taken it in such a wonderful direction with the help of the staff and board. She is a great asset. I'm very sorry to see her go but wish her well! Mayor Greg Krischke – I've know Stefanie since she worked at the EDA. Her attention to detail is excellent and she has a very positive attitude. There couldn't have been a better job for her. There will be a big hole when she leaves. She's a very special lady. She fit into the Chamber like a well fitting glove and selfishly I wish she wasn't leaving! Jessica Roth, Communications and Marketing at the Leduc Chamber – I am devastated about her leaving! She is awesome to work with, an inspiration, a great leader, and fun all wrapped up into one! Tracy Hartfelder, Event Coordinator at the Leduc Chamber – I was numb when she told me. I was none too happy! I've worked for a lot of different and great bosses but none this inspirational. She's pretty special. She's allowed us to become the best we could be. Pam Fouillard, Reception and Princess of First Impressions – She's one of the most amazing women I've ever met. I'm sad to see her go but I am looking forward to visiting her in Australia!